Berlin Marathon and training for it ! "The Berlin Marathon, Fastest Course in the World. How to Prepare and be Training for it." The Berlin Marathon, that is the "real,- Berlin Marathon" is held in September each year in the capital of Germany and may be the fastest marathon course in the world - so you want to be marathon training for a fast course to prepare and plan your Berlin marathon training. In 2006 Haile Gebrselassie set the world record there, and before several records has been set there, including by Paul Tergat and Ronaldo da Costa with his 2.06. Running the Berlin marathon means a training plan, schedule with a focus on flat running in close to ideal surroundings. In this article you'll find the info you'll need about the Berlin marathon. Did you enter through this page ? Then welcome to Marathon Training Schedule ! Looking for specific training for a marathon.. please check out the maraton training frontpage first. Or... continuo to read about the Berlin Marathon. For many years following World War II, Berlin was a divided city, as Germany was a divided nation. So it was that, in October of 1974, with the running of the first Berlin Marathon, the course could not wind and run throughout the entire city. It was a small event that day; less than three hundred runners participated in the race. Only a few years later, the Berlin marathon saw its first world record. In 1977, Christa Vahlensieck set a new world record for women with two hours, thirty-four minutes, and forty-seven seconds. In those early days, it was difficult to have a great many runners. So, it was with some pride that the 1985 Berlin marathon was able to say that ten thousand runners had registered for the race. Special Note for the Books : the 1990 Marathon in Berlin. Things were much different on September 30th in 1990. That was when 25,000 athletes poured through the Brandenburg Gate, and the unified city saw its first true Berlin Marathon Race. It was reported that a great many of the runners had tears in their eyes as they ran through that historic gate. Then, in 1998, the twenty-fifth running of the Berlin marathon, two records were shattered. That year saw a record number of runners - 27,621, and Ronaldo da Costa ran the race in two hours and six minutes; thus becoming the first runner to clock an average speed of over twenty kilometers per hour for the race. The very next year, the women's record was broken by Tegla Loroupe from Kenya. Her time of two hours, twenty minutes and forty-three seconds was outstanding. The Berlin marathon is usually held at the end of September, and as of January 2006, the World Marathon Majors was launched; a collection of the five biggest marathon races held around the world. They are the Boston Marathon, the New York City Marathon, the Chicago Marathon, the London Marathon, and the Berlin Marathon. Collectively, they offer a one million dollar prize purse that is split equally between the champion women's and men's runners. The Berlin Marathon is usually run in September when temperatures of 15-20 degrees C (60-70 degrees F) are to be expected. As for registration, the Berlin marathon is nothing if not high-tech. Visit their "real berlin marathon site"
The race allows you to use a bank transfer or credit card to pay the entrance fee, and they send you a confirmation e-mail the moment payment is confirmed. In the event you prefer to take care of registration by snail-mail, you can download a pdf of the registration form, print it out, fill out all of the information, and send it via standard post. You can enter the main group, the seniors, the juniors, and then there are several special categories. They encompass wheelchair racers, hand cyclists, and the power walkers. Early registration - prior to April 25th is 55 euros. From April to June, it goes up to 75, and then from June to August 1st, it is 95. Results from Berlin Marathon. Fast times 2004,2005,2006,2007,Before and Beyond ! As you might expect, the winners in the men's and women's categories for the first half dozen or so years of the Berlin marathon were from West Germany. Over the years, many of the female winners have come from nations of Europe: Poland, Finland, East Germany, Belgium, and Ireland. Then, in recent years, a great many Japanese women have won. On the men's side, oddly enough, many of the winners have come from African countries. There have been a lot of winners from Kenya, South Africa, and Tanzania. Others have come from Poland, England, Denmark, Belgium, and even as far away as Australia and Colombia. The course for the Berlin marathon has changed quite a bit since its inception. The first race ran along a minor road next to the stadium where it was held. Today, the marathon proudly meanders throughout the entire city, past many historic buildings such as the Reichstag and Berliner Dom. It starts and ends at the center, within sight of the Brandenburg Gate. From there, it winds passed Charlottenburg, around Tiergarten, along Moabit and Mitte, and then south to Friedrichshain. After that, it winds west between Kreuzberg and Neukolin, through Schoneberg, over to Steglitz and Zehlendorf, before turning north back toward the city's center. Looping above Schoneberg, the course comes full circle as it comes out by the gate. 2007 was the first year that the Berlin Marathon was broadcast live, of German TV. The Berlin Marathon is known for a number of factors, including the fast course past historic landmarks. Also making it popular is the perfect integration of several disciplines such as marathon running but abed bodied and disabled athletes, power walking and inline skating. Berlin as a City. A City with a Heart, a City with a History. 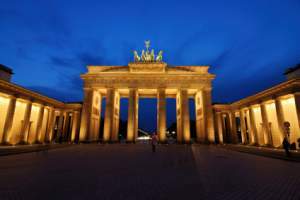 Many people tend to think of Berlin as only the capital city of Germany during World War II; the seat of Nazi power, and the place where Hitler had his bunker. The city stood for centuries before that madman and his cronies came along, and it will be here long after their memories are consigned to the dustbin of history. The place is full of culture and history, art and science, and all that the modern world has to offer. It does not matter what your interests, you can find something in the area to please you. The areas surrounding the city are beautiful in the autumn, around the time of the race, and there are all manner of sports and athletic activities available for you and your family to enjoy. If you love to hunt, fish, camp, or partake of any sort of outdoor fun, the geography of Germany is ideal for you. Some people find that German food is not to their liking. Well, perhaps you've never had it prepared properly. Berlin has some of the finest restaurants in Europe; so give the local cuisine a chance before turning your nose up at it. Of course, shopping is abundant as well. As the city sits at such a central spot of Europe, there are shops there with goods from all over the continent. So, no matter what your tastes, consider a visit to Berlin for the next marathon, and then stay a while to sample all that the city has to offer. You will find that the city is a glorious blending of its opulent history, its noble past, and its bright outlook for the future. Good luck with the Berlin marathon preparation ! Rock and Roll Marathon - The Rock and Roll Marathon, one of the best marthon races out there.